RT: I wonder what Neytiri is doing? RT2: Snapping Jake's neck would be funny. I might make a new MSN account. Just for you guys. Edit: Lol. My sis is watching RE 2 right now. RT: Damn. I think that would be awesome. Lol. I wonder what would happen if I snapped Jake's head on the Cat's Meow thread!? Lol. I might try doing that some time El. Great job tm20! See you guys later. Safety and peace. RT: I wonder if it's possible to hug someone for hours on end..
RT 3: I need to find a way to win a tickling face off..or at least tickle proof myself. 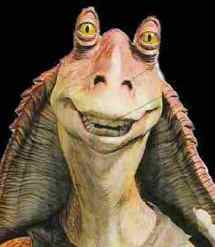 not always, but maybe for you..
Messa Jarjar Binks, messa your humble servant and yousa readin dis in my voice.